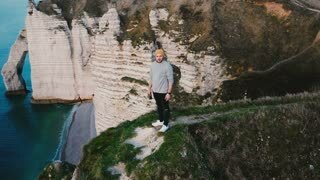 Search Results for "ocean cliff flying"
Drone flying around happy young newlywed couple watching epic sunset ocean view kissing on top of Normandy coast cliff. 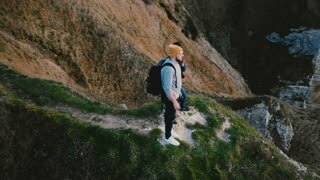 AERIAL: Flying over woman looking at the ocean from high cliff in Faroe Islands. 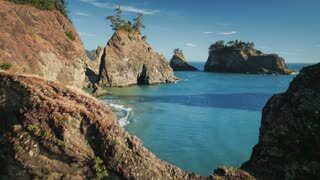 AERIAL: Flying along breathtaking grassy cliff overlooking the calm blue ocean. Blue water in sea lagoon and rocky cliff on shore aerial landscape from flying drone. Aerial shot ocean and mountain cliff on coastline. Top view sea island landscape. Rocky cliff on shore and blue sea drone view. Top view cliff mountain and turquoise ocean water. Landscape from flying drone rocky sea shore. Ocean flying to California coastal cliffs (aerial). Aerial footage of the beautiful ocean, rocky coastline and cliffs, captured while flying over a remote beach in Hawaii. 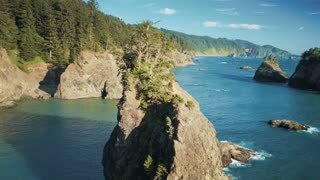 Mountain cliff and blue sea water aerial landscape from flying drone. Beautiful rocky cliff in turquoise sea water and skyline background. Ocean and rocky island top view.